The humble, or normal, sit-up is an abdominal strength training exercise commonly performed with the aim of strengthening the hip flexors and abdominal muscles. It has overlap with the crunch sit-up. It begins with lying with the back on the floor, typically with the arms across the chest or hands behind the head and the knees bent in an attempt to reduce stress on the back muscles and spine, and then elevating both the upper and lower vertebrae from the floor until everything superior to the buttocks is not touching the ground. Some argue that sit-ups can be dangerous due to high compressive lumbar load and may be replaced with the crunch sit-up in exercise programmes. Strength exercises such as sit-ups and press-ups do not cause the spot reduction (discussed later) of fat, abdominal muscular hypertrophy, that many people believe they do. Gaining a ‘six pack’ requires both abdominal muscle hypertrophy training and fat loss over the abdomen, which can only be done by losing fat from the body as a whole. The sit-up is a core exercise in any fitness professional’s arsenal. The sit-up is a callisthenic abdominal exercise that works the rectus abdominus muscles. It was once considered the gold standard for working the midsection, but fell out of favour due to controversy dealing with lower back injuries. The sit-up is still used by many military systems around the world as a gauge of abdominal endurance. Unlike the sit-up, in a proper crunch, the lower back stays on the floor. This is said by scientific literature to eliminate any involvement by the hip flexors, and make the crunch an effective isolation exercise for the abdominals. The difficulty of the crunch can be increased by lying on a declined bench and/or holding a weight on the chest or behind the head. However, some experts in exercise science doubt whether crunches are necessary for sports training, and even as few as 6–8 crunches per set are said to be enough (Reynolds, 2011). In human anatomy, the hip flexors are a group of skeletal muscles that act to flex the femur (thigh bone) onto the lumbo-pelvic complex, i.e. pull the knee upward. Collectively known as the iliopsoas or inner hip muscles: psoas major, psoas minor and iliacus muscle. Anterior compartment of thigh: rectus femoris (part of the quadriceps muscle group) and sartorius. One of the gluteal muscles: tensor fasciae latae. Medial compartment of thigh: pectineus, adductor longus, adductor brevis and gracilis. Without the iliopsoas muscles, flexion in sitting position is not possible across the horizontal plane. Internal Oblique: The internal oblique muscle is the intermediate muscle of the abdomen, lying just underneath the external oblique and just above (superficial to) the transverse abdominal muscle. External Oblique: The external oblique is situated on the lateral and anterior parts of the abdomen. It is broad, thin, and irregularly quadrilateral, its muscular portion occupying the side, its aponeurosis the anterior wall of the abdomen. In most humans (especially females), the oblique is not visible, due to subcutaneous fat deposits and the small size of the muscle. Transverse Abdominis: the transversus abdominis muscle is flat and triangular, with its fibres running horizontally. It lies between the inner oblique and the underlying transversalis fascia. It originates from Poupart’s ligament, the inner lip of the ilium, the lumbar fascia and the inner surface of the cartilages of the six lower ribs. It inserts into the linea alba behind the rectus abdominis. Rectus Abdominis: the rectus abdominis muscles are long and flat. The muscle is crossed by three tendinous intersections called the linae transversae. The rectus abdominis is enclosed in a thick sheath formed, as described above, by fibres from each of the three muscles of the lateral abdominal wall. They originate at the pubis bone, run up the abdomen on either side of the linea alba, and insert into the cartilages of the fifth, sixth, and seventh ribs. The abdominal muscles have different important functions. They provide movement and support to the trunk and assist in the breathing process. Moreover, these muscles serve as protection for the inner organs and together with the back muscles they provide postural support and are important in defining the form. The transverse abdominus muscle is the deepest muscle, therefore, it cannot be touched from the outside. It can greatly affect the body posture. The internal obliques are also deep and also affect body posture. Both of them are involved in rotation and lateral flexion of the spine and are used to bend and support the spine from the front. The external obliques are more superficial and they are also involved in rotation and lateral flexion of the spine. Also they stabilise the spine when upright. The rectus abdominus muscle is not the most superficial abdominal muscle. 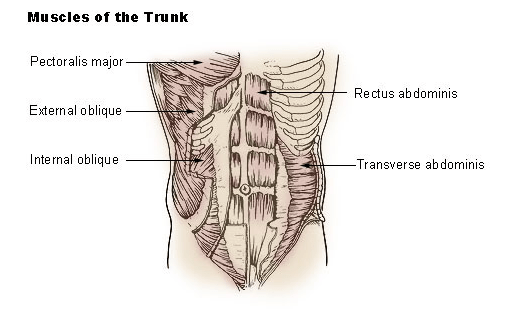 The tendonous sheath extending from the external obliques cover the rectus abdominus. The Rectus abdominus is the muscle that very fit people develop into the 6-pack ab look. Although, it should really be an 8 pack as there are 4 vertical sections on each side. The 2 bottom sections are just above the pubic bone and usually not visible, hence, the 6 pack abs. The rectus abdominals’ function is to bend one’s back forward (flexion). The main work of the abdominal muscles is to bend the spine forward when contracting coencentrically. The abdominal muscles can be worked out by practicing disciplines of general body strength such as Pilates, yoga, T’ai chi, and jogging among others. There are also specific routines to target each of these muscles. Sit-ups are an integral part of military physical fitness and many military systems around the world train daily with this classic exercise. All branches of the British armed forces, Army, Royal Navy, Royal Air Force and Royal Marines, require sit-ups on their physical fitness standard tests. However, since approximately 2000 the military has embraced the concept of core stability within its training programmes after carrying out research and concept work in partnership with the University of Loughborough. As such, within the modern context, one cannot talk about sit-ups without also mentioning the concept of core stability. Core Stability: What Is It? A comprehensive strengthening programme of these core muscles can be used for injury prevention, rehabilitation and sport performance enhancement. Different experts (both fitness professionals and sports scientists) include different muscles in this list, but in general the muscles of the core run the length of the trunk and torso. The following list includes the most commonly identified core muscles as well as the lesser known groups. Erector Spinae: this group of 3 muscles runs along your neck to your lower back. Hip adductors: located at medial thigh. As core muscles contract, they help sta­bilise the core by compressing and stiff­ening the spine (McGill, 2001; McGill et al., 2003). This is important, because the osteoligamentous lumbar spine buckles under compressive loads of only 90 N (approximately 20 lb), and core muscles act as guy wires around the human spine to stabilise the spine and prevent spinal buckling (McGill, 2001; McGill et al., 2003). This il­lustrates the importance of core muscle strengthening, which has been shown to decrease injury risk and enhance perfor­mance (Axler & McGill, 1997; Hewett et al., 1999; Myer et al., 2008). Moreover, strong abdominal muscles help stabilise the trunk and un­load the lumbar spine (Axler & McGill, 1997). “Generally speaking it appears that the spine is most prone to instability failure when the loading demands are low and the major muscles are not activated to high levels.” (McGill, 1999, p.80). For optimal core stability to occur, it appears that numerous core muscles, in­cluding both smaller, deeper core muscles (e.g. transversospinalis, such as the mul­tifidus, as well as transverse abdominis, internal oblique, and quadratus lumbo­rum) and larger superficial core muscles (e.g. erector spinae, external oblique, rectus abdominis), must contract in sequence with appropriate timing and ten­sion (McGill, 2001; McGill et al., 2003). Cholewicki and VanVliet (2002) who investigated the relative contribution of core muscles to lumbar spine stability reported that no single core muscle can be identified as most important for lum­bar spine stability. Moreover, the rela­tive contribution of each core muscle to lumbar spine stability depends on trunk loading direction and magnitude (spi­nal instability is greatest during trunk flexion, such as during the bent-knee sit-up), and no one muscle contributes more than 30% to overall spine stability (Cholewicki & Van Vliet, 2002). Therefore, trunk stabilisation exercises may be most effective when they involve the entire spinal musculature and its cor­responding motor control under various spine loading conditions (Cholewicki & Van Vliet, 2002). However, it should be emphasized that exercises that demand high core muscle activity not only enhance core stability but also gen­erate higher spinal compressive loading (Kavcic et al., 2004) which may have adverse effects in indi­viduals with lumbar spine pathology. A Strong Core Improves Postural Imbalances: training the muscles of the core helps correct postural imbalances that can lead to injuries. The biggest benefit of core training is to develop functional fitness; the type of fitness that is essential to daily living and regular activities. There may be potential danger of damaging the spine with continuous tensing of the trunk muscles during daily and sports activities. Patients who have been trained to use complex abdominal hollowing and bracing manoeuvres should be discouraged from using them. Abdominal exercises put some degree of compressive force on the lumbar spine, putting unwanted stress on the lower back (Escamilla et al., 2010). In addition, exaggerated abdominal exercise can cause respiratory problems. A study of twelve exercises concluded that no single exercise covered all abdominal muscles with high intensity and low compression (Axler & McGill, 1997). Keep in mind that the only way to build muscle is to push the muscle beyond its endurance limits. But if you do so many sit-ups to the point that you start to feel a stinging sensation on your abdominals, you have done too much. Your form will start to deteriorate and you won’t be performing a proper sit-up. Do not hold your breath as this is a signal that you are not relaxed. You must learn to breathe normally since you will need to breathe when you are running! Repeat these steps for the remainder of the exercise. Only do two to three if you’re a beginner and slowly build up the amount over time, as your strength increases. There exists an argument between sports scientist’s, and the fitness industry in general, as to whether the spine should be flexed to work the abdominals such as with sit-ups and crunches. These concerns are predicated on basis that the spine has a finite number of flexion cycles and that too many flexion movements will lead to degeneration of the spine. Some fitness experts have even confidently argued that ‘flexion is the enemy of the spine’. Our spines are in flexion the majority of the day while working at desks, eating and driving, and lower back disc bulges poking out the back (moved in that direction with spinal flexion) are far more frequent than those poking out the front (moved in that direction with spinal extension). Based on research (Contreras & Schoenfeld, 2011) that has shown a cause-effect relationship between spinal flexion of pig spines and disc damage, there are experts that believe extra spinal flexion within the fitness world should be avoided at all costs. Spinal movements have repeatedly been shown to offer therapeutic benefits provided the exercise does not exceed the adaptive capacity of the tissue. Everyone will handle exercises differently some can tolerate more flexion in their spines than others. The best thing you can do is listen to your body and if you start developing a twinge in your lower back when you train spinal flexion exercises, don’t do them! Sit-up (Arms on Shoulders): Hook feet under foot brace or secure low overhang. Lie supine on mat or bench with hips bent. Cross arms and place hands on front of shoulders. Raise torso from mat or bench by bending waist and hips. Raise crossed arms over knees at top. Return until back of shoulders contact mat or bench. Repeat. Sit-up (Arms to Side): Lie supine (on your back) on mat or bench with hips bent and feet on floor or bench. Hook your feet under foot brace or secure low overhang if required to keep feet down. Extend the arms down to the sides. Raise the torso from mat or bench by bending waist and hips. Extend hands toward sides of heels. Return until back of shoulders contact mat or bench. Repeat. Spot reduction refers to the belief, long viewed as a myth, that fat can be targeted for reduction from a specific area of the body. This is a common view, although many people believe that view is misguided, that it is possible to achieve spot reduction through exercise of specific muscles in the desired area, such as exercising the abdominal muscles in an effort to lose weight in or around one’s midsection. Advertisers exploit this concept when advertising exercise-related products. However, many fitness experts do not believe it is possible to reduce fat in one area by exercising that body part alone. Instead, fat is lost from the entire body as a result of diet and regular exercise. Muscle growth in the abdominal region does not reduce fat in that region. Instead, being on a caloric deficit is recommended for reducing abdominal fat. The misunderstanding may be attributed to the firming and shaping effect of muscle hypertrophy. When additional muscle is built, it takes up new space which can briefly compress subdermal fat against the skin until the skin adapts, a larger bulging muscle shape is also more easily seen through the layer of fat on top of it. This can give the illusion of fat being reduced when it has not. For example, triceps hypertrophy firming the back of the arm. A 2006 study published in the American Journal of Physiology (Stallknecht et al., 2006) seemed to indicate that spot reduction may be possible, although to what degree is unclear. In the study, conducted at the University of Copenhagen (Denmark), scientists had male subjects perform single-leg extensions with light weight for 30 consecutive minutes. The researchers then measured the amount of blood flow to the subjects’ subcutaneous fat cells in both the exercising and resting thighs, as well as the amount of lipolysis from those fat cells. The scientists observed increases in blood flow and lipolysis in the exercising leg when compared to the resting leg. The study suggested that during exercise, body fat is preferentially used from the area being trained. Muscle hypertrophy is an increase in the size of a muscle through an increase in the size of its component cells. It differs from muscle hyperplasia, which is the formation of new muscle cells. Depending on the type of training, the hypertrophy can occur through increased sarcoplasmic volume or increased contractile proteins. Lipolysis is the breakdown of lipids and involves the hydrolysis of triglycerides into free fatty acids followed by further degradation into acetyl units by beta oxidation. The process produces Ketone bodies, which are found in large quantities in ketosis, a metabolic state that occurs when the liver converts fat into fatty acids and ketone bodies, which can be used by the body for energy. Lipolysis testing strips are used to recognise ketosis. Lipolysis during stress occurs in the fat cells, which, in turn, increases cholestrol during chronic enduring stress. Agonist: a muscle that causes motion. Antagonist: a muscle that can move the joint opposite to the movement produced by the agonist. Target: the primary muscle intended for exercise. Synergist: a muscle that assists another muscle to accomplish a movement. Stabiliser: a muscle that contracts with no significant movement to maintain a posture or fixate a joint. Dynamic Stabiliser: a bi-articulate muscle that simultaneously shortens at the target joint and lengthens at the adjacent joint with no appreciable difference in length. Dynamic stabilisation occurs during many compound movements. The dynamic stabiliser may assists in joint stabilisation by countering the rotator force of an agonist. Antagonist Stabiliser: a muscle that contracts to maintain the tension potential of a bi-articulate muscle at the adjacent joint. The antagonist stabiliser may be contracted throughout or at only one extreme of the movement. The antagonist stabiliser is activated during many isolated exercises when bi articulate muscles are utilised. The antagonist stabiliser may assist in joint stabilisation by countering the rotator force of an agonist. Antagonist Stabilisers also act to maintain postural alignment of joints, including the vertebral column and pelvis. For example, Rectus Abdominis and Obliques counters the Erector Spinae’s pull on spine during exercise like the Deadlift or Squat. This counter force prevents hyperextension of the spine, maintaining the tension potential of the Erector Spinae. Isotonic: the contraction of a muscle with movement against a natural resistance. Isotonic actually means ‘same tension’, which is not the case with a muscle that changes in length and natural biomechanics that produce a dynamic resistance curve. This misnomer has prompted authors to propose alternative terms, such as dynamic tension or dynamic contraction. Isokinetic: the contraction of a muscle against concomitant force at a constant speed. Diagnostic strength equipment implements isokinetic tension to more accurately measure strength at varying joint angles. Concentric: the contraction of a muscle resulting in its shortening. Eccentric: the contraction of a muscle during its lengthening. Dynamic: the contractions of a muscle resulting in movement. Concentric and eccentric contractions are considered dynamic movements. Isometric: the contraction of a muscle without significant movement, it is also referred to as static tension. Fitness pioneer Jack LaLanne set the original benchmark for sit up-ups by completing 1,033 sit-ups in 23 minutes (averaging 44.9 per minute). James (Jim) Clark, setting a world record 2,201 sit ups in one hour (averaging 36.7 per minute) at the Mall of America in Bloomington (Minnesota, USA), on June 2, 2006. This apparently broke the existing record of 1,448 by a man from India. It took him just 32 minutes to break the record and he did another 753 by the time his hour was up. On April 1st, 2011, 60 year old Vladimir Jurcik broke Jim Clark’s world record by just 37 sit-ups, achieving 2238 crunches in Rundle Mall, Adelaide South Australia. This record has not been officially confirmed. Freitas broke his previous record of 111,000 sit ups in 24 hours by completing 133,986 in 30 hours. Many people remember Mark Pfeltz for setting the Guinness Book of World Records for number of sit-ups by completing 45,005 sit-ups in approximately 58.5 hours. Axler, C.T. & McGill, S.M. (1997). Low Back Loads over a Variety of Abdominal Exercises: Searching for the Safest Abdominal Challenge. Medicine & Science in Sports & Exercise. 29(6), pp.804–810. Cholewicki, J. & Van Vliet, J.J. (2002) Relative Contribution of Trunk Muscles to the Stability of the Lumbar Spine during Isometric Exertions. Journal of Clinical Biomechanics. 17, pp.99-105. Contreras, B. & Shoenfeld, B. (2011) To Crunch or Not to Crunch: An Evidence-Based Examination of Spinal Flexion Exercises, Their Potential Risks, and Their Applicability to Program Design. Strength and Conditioning Journal. 33(4), pp.8-18. Escamilla, R.F., Lewis, C., Bell. D., Bramblet, G., Daffron, J., Lambert, S., Pecson, A., Imamura, R., Paulos, L. & Andrews, J.R. (2010) Core Muscle Activation During Swiss Ball and Traditional Abdominal Exercises. Journal of Orthopaedic and Sports Physical Therapy. 4(5), pp.265-276. Hewett, T.E., Lindenfeld, T.N., Riccobene, J.V. & Noyes, F.R. (1999) The Effect of Neuromuscular Training on the Incidence of Knee Injury in Female Ath­letes. A Prospective Study. American Journal of Sports Medicine. 27, pp.699-706. Kavcic. N., Grenier, S. & McGill, S.M. (2004) Quantifying Tis­sue Loads and Spine Stability while Performing Commonly Prescribed Low Back Stabilization Exercises. Spine. 29, pp.2319-2329. Lederman, E. (2007) The Myth of Core Stability. Available from World Wide Web: < http://www.cpdo.net/jour/jour1.html> [Accessed: 01 October, 2012]. McGill, S.M. (1999) Stability: From Biomechanical Concept to Chiropractic Practice. Journal of the Canadian Chiropractic Association. 43(2), pp.75-88. McGill, S.M. (2001) Low Back Stability: From Formal Description to Issues for Performance and Reha­bilitation. Exercise and Sport Science Review. 29, pp.26-31. McGill, S.M., Grenier, S., Kavcic, N. & Cholewicki, J. (2003) Coordination of Muscle Activity to Assure Stabil­ity of the Lumbar Spine. Journal of Electromyography Kinesiology. 13, pp.353-359. Myer, G.D., Chu, D.A., Brent, J.L. & Hewett, T.E. (2008) Trunk and Hip Control Neuromuscular Training for the Prevention of Knee Joint Injury. Journal of Clinical Sports Medicine. 27, pp.425-448. Nieman, D.C. (1999) Exercise Testing and Prescription: A Health Related Approach. 4th ed. Mountain View, CA: Mayfield Publishing. Reynolds, G. (2011) Are Crunches worth the Effort? Available from World Wide Web: <http://well.blogs.nytimes.com/2011/08/17/are-crunches-worth-the-effort/> [Accessed: 01 October, 2012]. Stallknecht, B., Dela, f. & Helge, J.W. (2006) Are Blood Flow and Lipolysis in Subcutaneous Adipose Tissue Influenced by Contractions in Adjacent Muscles in Humans? American Journal of Physiology. 292(2), pp.E394-399. Top End Sports (2012) World Best: Number of Sit Ups. Available from World Wide Web: <http://www.topendsports.com/testing/records/situps.htm> [Accessed: 01 October, 2012].